bbwm | Filed in News. Game Ready is ready for you at BackBasics. 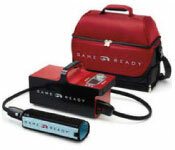 Game ready was introduced to me while treating and traveling with the San Francisco 49ers. Game Ready is definitely more comfortable then standing in some Ice Chamber in subzero temperature. Extremity injuries such as ankle, knee and shoulder can be difficult to ice due to the bony articulations of the joint. Game Ready allows the operator to dial in the exact temperature and pick the desired level of compression. This system allows for a decrease in swelling and promotes faster healing time. This is just one of our sports medicine modalities that will help you get BACK to your GAME! Where is my back pain coming from? Why is our Healthcare Broken? Avoid these pitfalls with thisFree Report!